A Malaysian in France: We got a nutcracker, yeah! My MIL came by and gave us a lot of stuffs, one of them is this nutcracker. Of course she bought us the nuts too. I found the nutcracker very useful and it cracks easily. 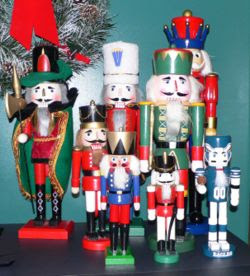 Nutcrackers in the form of wooden carvings of a soldier, knight, king, or other profession have existed since at least the 15th century. These nutcrackers portray a person with a large mouth which the operator opens by lifting a lever in the back of the figurine. Originally one could insert a nut in the big-toothed mouth, press down and thereby crack the nut. The ballet The Nutcracker derives its name from this festive holiday decoration. Can you imagine opening the mouth of these status and crack a nut? I don't know how it would work actually.